I booked my tickets for the 24th of March and among the 5 of us, the planning commenced. Lists upon lists were made – what we HAVE to do, what is not as cool as you might think, what have some of us already seen, what would be cool to see if we had any free time, what things we could do for free, etc., etc. Already I could tell that this time would be different than the first – I was not use to planning out the days hour by hour 2 months ahead of the time, but the excitement made me buckle under the peer pressure. As the 24th of March got closer and closer, I didn’t even want it to arrive anymore, because I knew the time with my friends would just fly by within the wink of an eye. But the 24th did come, and before I knew it, my Uber dropped me of at Salt Lake City airport, and I was on my way. I flew in to Newark airport and took the train to Penn station where my friend, Hannah’s bike messenger from work (I know, so New York right) would bring me the keys to her apartment in *Brooklyn (*always say Brooklyn the Trevor Noah way). The moment I stepped out into the City from the station, I was undoubtedly in New York: Crazy individuals were talking to either themselves or their invisible friends, the streets smelled of fresh urine and a very smooth young man was trying to sell me a ticket to a bus tour – it was like I was falling in love all over again! Just kidding – that really happened, but I was falling in love in spite of all that. If I remember correctly, I literally did I twirl with my arms spread out wide, smiling from ear to ear and breaking my neck looking up to the very tips of all the skyscrapers that are part of probably the most famous skyline in the world. This was what I was dreaming of getting back to, and there I was! I got the keys from the messenger, and hauled my luggage up and down several sets of stairs taking the subway to *Brooklyn. Since my friends were only arriving later in the evening, I sat working on my laptop in Hannah’s apartment, like a modern day, *Brooklyn version of Carrie Bradshaw (minus the men throwing themselves at me). I was trying to imagine if I could live there, like I so often do, but the consensus on that is still out. I took the subway back to Union Square, where most of the girls were staying with the sister of the soon to be bride.It was so surreal meeting each other at someone’s house in New York City, but this was our life now – just casually meeting friends from South Africa, Namibia and England in New York, that’s just how fancy we are. We babbled so much switching between being well mannered and speaking English, and not caring about anyone else and screaming at each other in Afrikaans. We kicked of our first night by going out to one of the maaany Irish bars in NY, called Finnerty’s. We had such a blast catching up and meeting new people and decided also that the night called for some karaoke, so we headed to Sing Sing Karaoke where we all just continued screaming into mics. To conclude, we screamed a lot. Then the long way back to *Brooklyn lay ahead for Elizma and I. For the days that followed, I will give a short layout of what our days looked like (that’s what happens when you write a blog 4 months after the actual event). Friday: Early a.m. was spent waiting in line to buy Broadway tickets to Something Rotten! Later a.m. was spent taking pictures of the Wall street Charging Bull, going to the National Museum of the American Indian for 5 minutes, and strolling around in Battery Park whilst waiting for Charne’ to get back from her job interview (now that’s some real Carrie-ing). Early p.m. was spent eating Chipotle in Bryant Park (Mariska in Bryant Park = overflowing heart) and eating cannolis at Carlos’ bakery (Mariska at Carlo’s Bakery = overflowing baker’s heart). 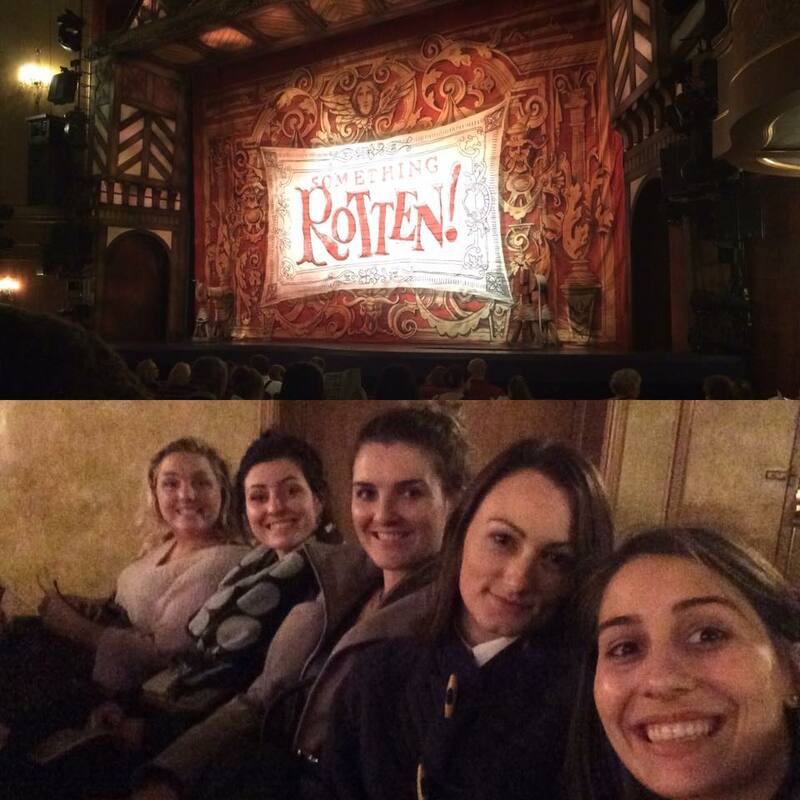 Late p.m. was spent seeing Something Rotten on Broadway, which was an uh-mazing experience, totally worth the whole it left in my wallet! Saturday: Early a.m. we strolled along the Brooklyn bridge, Starbucks in hand, gazing at the daytime skyline. Late a.m. we took the Long Island Ferry, to, well, Long Island, to get a glimpse of the Statue of Liberty. Early p.m. we ordered a couple of pizzas in Brooklyn at Williamsburg Pizza and munched away at Hannah’s apartment while playing with her cat, Willie. Late p.m. we thought we deserved some wine, and ordered a couple of bottles at the Union Square Cafe’. Sunday: I joined Hannah’s family for the Easter service at the Saint Patrick’s cathedral. This was really special to me, as I was actually going into a service as apposed to taking pictures of this stunning building from the outside. It was also the first Catholic service that I’ve ever attended and unfortunately I embarrassed myself a couple of times, even though I think I was the only one who noticed. After that I met my friends at Smith’s for brunch, which I can highly recommend! We then headed to the Met in the late a.m. to see if we could make it for the free entrance. Uhmmm nope, the line was just a cool 7 hours long…so to the gift shop it was (which was like a whole museum anyway), but not after taking just a couple of Gossip Girl inspired pictures on the stairs of the Met! We got our early p.m. caffeine fix and headed to Central park for a stroll and people watching. By the way, since it was Easter Sunday, the dogs were OBVIOUSLY all dressed up in bunny ears. Central Park was filled with bunny dogs. After Central park we headed back through Times Square (a much dreaded but much needed stop), took one picture and got the hell out of that tourist infested ant hill (yes I know I know, I’m a tourist too…). We then headed to a stand up show at the comedy cellar with Melissa and her friends and got a last round of drinks at a bar close by. Again, the trek back to *Brooklyn awaited Liz and I, but not before saying goodbye to Maryke, as she was heading back to Maryland the next morning. Monday: We decided to go to the Macy’s early morning and see the flower show there. Shopping commenced. The size of that store still blows my mind (I got lost looking for the Aunt Annie’s pretzels inside the store). At around lunch time, we headed to the Grand Central Terminal and spent way too much time in the whisper gallery. For lunch, we stopped in at the Central Cafe’, and Charne’ got her Turkey Burger fantasies satisfied. Liz and I decided to go back to Central park, to explore it by Citi Bike, and enjoyed it a little too much, making us a little late for our Top of The Rock slot. We made it though, and watched the sun set from above, while drooling in the general direction of the Chrysler building. From there, we were on our way to Rosa Mexicana, where we had an early celebration for my 26th birthday which was the next day. Liz and I decided to spend the night at Melissa’s in Union Square, as everyone was heading to DC the next morning, except for me. Tuesday: My BirthDAY commenced with us getting a cab and driving to the bus station, where I had to say goodbye to my friends and goodbye to speaking Afrikaans. Sad times indeed. I was going to spend my birthday on my own, but I was in New York City, so who cares! I did meet up with Hannah though, and she treated me with a lovely breakfast before she had to get to work. After she left, I made my way to the Fashion Institute of Technology, where they had a Fairy Tale Fashion Exhibition. My day was spent exploring parts of New York that I hadn’t been to before, and I made a last stop and Barnes and Noble, where I treated myself to quite a few gifts. Hannah and I then met up again and went to a Barbecue joint in Williamsburg, called “Vette Sau” which translates into Fat Pig. Perfect. We sat next to a German Family, who as per usual, started to converse with me in German, as soon as they heard that I was from Namibia. As a side note, many thanx to them and Hannah for insisting on singing happy birthday to me. Hannah and I went back to her apartment, were we reminisced about old times and she taught me about the endless possibilities of Snapchat early into the morning.